Talk about myths busted. I went to Dubai planning to buy zat'ar, the fragrant herb and spice mix. And Dukkah, the interesting blend of nuts and spices. Not sumac, because I still have a pack left in my fridge. So zat'ar was easy - every Carrefour supermarket had that one. But no one had dukkah and I was like, how can they not have dukkah? It's a middle eastern thing, right! But well, they don't sell dukkah in Dubai, so I came back and armed with recipes from 10-odd blogs (all roughly the same), I set to make my own. The key to making dukkah is : line up all your ingredients, toast each of them separately in a heavy non-stick pan till they are fragrant and lightly roasted, then put everything in a blender and grind coarsely. This is your dukkah. Now dip your bread in olive oil, then dip it in dukkah and indulge. A final word of warning: this can be highly addictive. Hmm..never heard of dukkah. It does look addicting. I think I'll make some as well. This is new to me :) shall try it some time. I had tasted dukkah when i went to kuwait..Yes u r rite they are so addictive ..
Oh I've heard of this but I haven't tried making it. Very interesting! Thanks for stopping by my blog. I'm so happy to meet a fellow food blogger from Bombay! :D Where in the city are you? wow thats a neat recipe simran...founds very interesting and simple too! Very new to me,but thanks for the recipe .Also read Rekhas comment on finding it in Lulu.Let me see if I can get hold of something.I am still in search of Sumac. 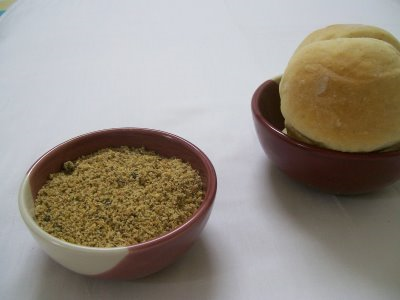 Mind me asking, is this the same dukkah they eat with Laban in Medina Munawwara?